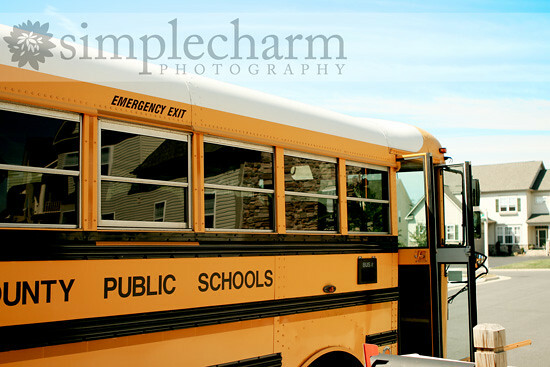 our perfectly imperfect life: Back to school, kiddos. Whelp ... I guess summer got busy. So much for my pact with um ... myself ... to blog about our summertime adventures. I feel like therapy has consumed our life and I am currently evaluating our 4-mornings-a-week therapy schedule ... momma needs a break! Somehow, it has been almost 7 years since I became a momma. I ... in no way, shape or form ... know where the time has gone and that bums me out. Big time. I feel like I've missed so much, even though I've been here the whole time! School is back in session. Man, I love my kids but I'm loving the fact that I have my afternoons to myself this year! Our mornings are nutso ... three kids, three different buses, three different elementary schools. Come lunchtime, I'm ready for a break! Mason has started 1st grade. 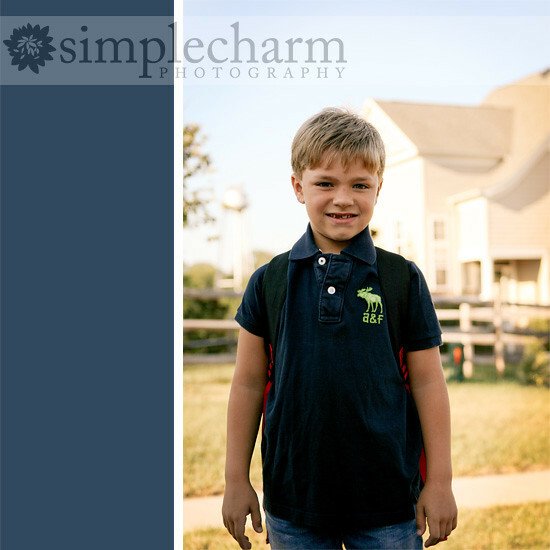 I think he and I both were more nervous for him to start 1st grade than we were for kindergarten. I don't know what it is ... the fact that he is older, has more responsibility and is more aware of the social aspect of school? Why does the social aspect of everything stress me out so much?! Speaking of ... I snapped this picture in a hurry as we got out of the car at the bus stop. Mason was less than thrilled and sort of placed himself behind the car so his friends would not have to see his mom doting on him. Oh dear ... I am such an embarrassment! Nika was so excited to start school this year ... she jumped right into the mix of things at orientation ... I'm excited to see what this school year does for her being in a peer modeling classroom. Even though Nika is just 9 months younger than Payton, I feel like developmentally she is so much younger. She has come so far since coming home from Russia, but she still has a lot of catching up to do. We are waiting for more spontaneous speech to show up ... her therapists do not believe she has apraxia like Payton, just really weak oral motor function. She can repeat every letter and sound of the alphabet, but developmentally she is not really putting those sounds together spontaneously. Payton continues to be the little mother hen to Nika ... sometimes nicely, sometimes overboard. Ahem ... bossy little thang. Payton is in love with school. Even the sheer mention of school, she runs to get her backpack and is ready to go ... whether or not she gets to go to school that day. 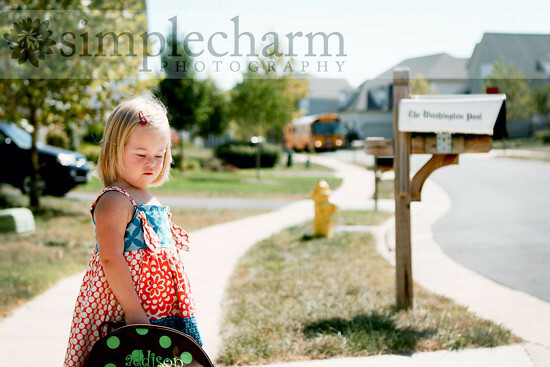 The fact that Mason got to get on his bus before her was a problem ... a big problem. 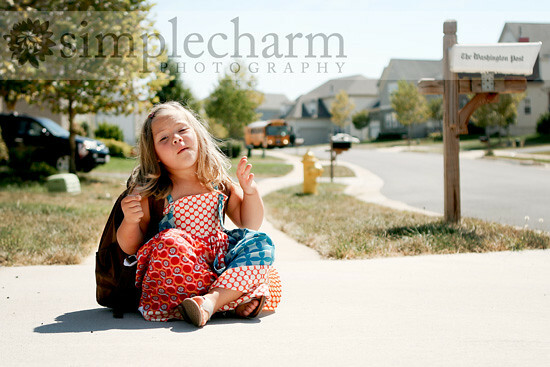 I had to pull her from his bus line ... kicking and screaming. Oh, she cried. She just wants to get on the bus with everyone else! Hopefully now that she knows the bus order, things will be better ... even Nika gets to go before her. I was so excited to wait for her bus with her. I knew she would be so excited ... and of course I missed all the rah-rah-jump-up-and-down on video. Grr. Crazy chick. I can't believe we only have one year until kindergarten ... ahh! Awh they are so excited !!! Hope they had a great first day at school. And bummer those high steps !! Your kiddos are just too cute. That squishy face of Nika's is the cutest thing ever!!! thanks for sharing Bethany, so much fun watching your children head off to school. we are 6mths in front starting in Jan. Sadly that means 6mths till we start Pre (your Kindergarten) our kids all have to wear uniforms here. hope Mason had a wonderful first day. My Matt same age is loving school so much. Love your blog. The girls are getting so big! Thanks for sharing! They are such beautiful, sweet kids! You are such an awesome Mama! Oh loved when Payton fixed Nika's hair. What a little mommy making sure she was pretty for the bus! You are not as embarrassing as I am! I actually meet the kids at school and take their pictures in their classrooms. Grace still thinks it's a great idea (in 2nd grade)....Jack, not to happy (5th grade) :). What are moms good for if we can't embarass them a little :). They will like the pictures when they are old and have their own kids! ROFL!!!!! "Whelp"...Meaning=female dog having puppies. ROFL Ok, so I cried when Nika got on the bus. How I remember that very first day with Angela. It was so very long ago! Wow. How can one not smile at Payton's exuberance? She is a riot. Love that girl! yeah!!! so glad they love school and ride the bus. I still havent gotten to the point where I will let Mayson ride the bus yet (sigh). Are you loving your free afternoons or what???? love the review, and loved to watched the old posts, yeah so much has changed. It's hard for me to look at any picture or video of Nika and not think about how different her life is today because of the love and opening of your heart and family to her. You have a such a beautiful family! Love the videos of the girls getting on the bus. Wish I would've taken some video of Morgan when she used to ride the bus. So little going off to school on the big school bus. Love all your pictures. Wish you lived closer so you could give me a little photo class! Precious!!! and I second Heather. It amazes me to see what her life is and to know what it could have been. Oh my goodness, they are just adorable! I love the video and the photos with the bus coming in the background! I feel your pain regarding the therapy schedule. We go four afternoons during the week! All of the running around is exhausting! your photographs are AMAZING. 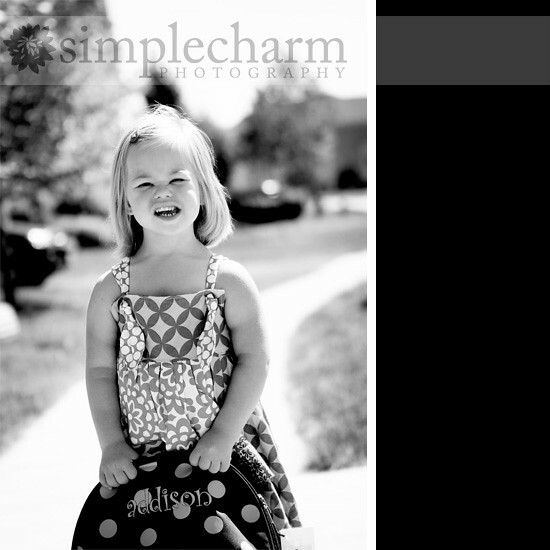 of course, your kids are beautiful subjects :).